Slides 1 and 2: When we added the addition to the house in ’99 we removed a pentagon window from the dome and placed it at the far end of the living room. The window is centered on a hemlock tree; a tree that was much smaller when we moved here. 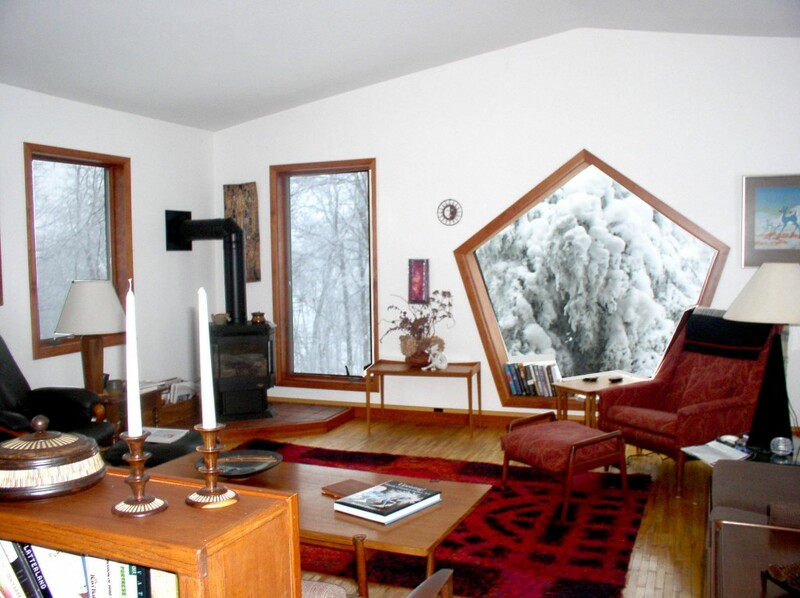 The snow sits on it all winter, and it breaks the prevailing west wind; in the summer it blocks the sun and provides shade to cool the living room. Slide 3: There are three pentagon windows in the dome. They sit at an angle and the snow often lays on them and darkens the room. But the sunshine quickly melts the snow and our beautiful views are back in sight. Slides 9 and 10: We purposely did not cut down the dead tree, because the birds so often perched on it. In fact we called it “the bird tree”. Alas, Hurricane Sandy came along and knocked it down. We miss it. Please note that all these photographs were taken through these windows. However, because of the brightness outside, the interior often turned out too dark, so for those photos I’ve re-framed them in their same windows to show the interior. Your presentation is exquisite, Denny. Your photos are glorious, and show the love you have for the Place you live. Thank you for sharing them with us all. Surely the life around George and me has become so beloved, and we have some framed along with our children and grandchildren — surely the deer and the birds and all the beauty here in its many dimension represent our own precious larger family. We’ve begun to keep our pictures of each moment here in an ever growing slideshow. We’re hoping they will sustain us when we have to leave our home.